From a small settlement along the Rio Grande to a major metropolitan area at the crossroads of three states and two nations, El Paso has grown immensely. Known as the "Sun City," the region has always attracted individuals and families from around the world who were looking to establish roots and make their mark. In the early days, pioneers such as Zach White, Anson Mills, and Joseph Magoffin helped lay a solid foundation on which the city was built. Gunfighters like John Wesley Hardin walked the streets of El Paso, while lawmen like Dallas Stoudenmire did their best to keep them off. Lining the streets of El Paso were, and still are, beautiful edifices designed by famed architect Henry Trost. El Paso's unique location, history, and culture have helped inspire many artists, writers, and musicians, such as Jim Ward, Cormac McCarthy, and Tom Lea. 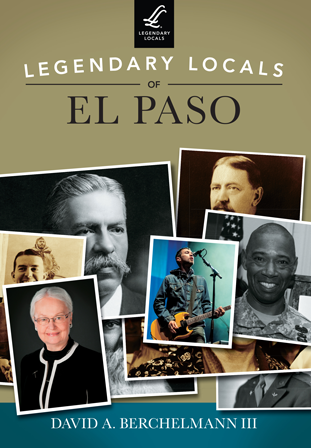 Take a moment and learn about some of El Paso's legendary locals. David A. Berchelmann III has been a Texan all of his life and has lived in El Paso since 2008, when he began chronicling his journeys in a new city. In his free time, he is busy exploring and learning about the history, culture, and all-around uniqueness that is El Paso.